The best scones I ever had were at the Savoy Hotel in London for afternoon tea. After many tries, I feel I have perfected the scone. Just made this morning for our breakfast and served with Orange Marmalade from Frog Hollow Farms. In a large bowl, place the flour, 2 tablespoon sugar, baking powder, salt and butter cubes. Mix together and use either your fingers or a pastry cutter. Continue until the butter is a fine grain. Add the milk and mix together. Once well combined, place the dough onto a well floured cutting board. Knead with a bit of the flour until a bit less tacky. Flatten to about one inch thick. Use a 2 inch round cookie cutter out the scones. 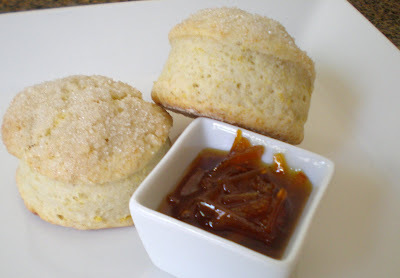 Continue the process of kneading the dough together and press to one inch thick and cut scones until the dough is gone. Place onto a non-stick or lightly greased cookie sheet. Preheat oven to 375. Brush each scone with the half/half and sprinkle with sugar. Bake for about 20 minutes. Serve with your favorite jam or preserve.